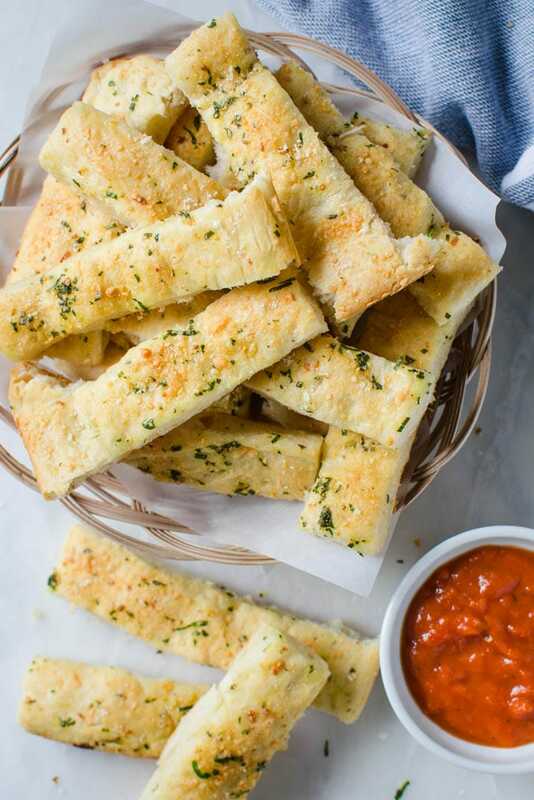 These homemade garlic parmesan breadsticks are so delicious and tempting. 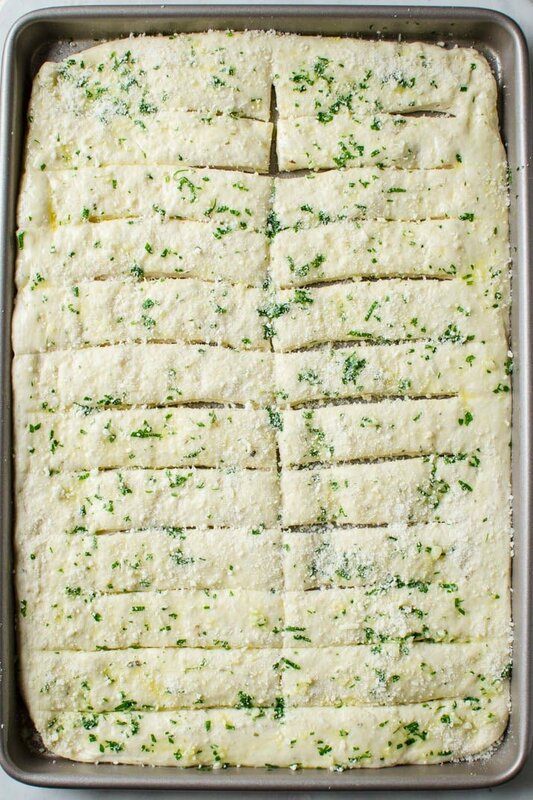 Fresh garlic, parmesan and subtle flavors of herbs make these breadsticks the best ever! And they are super easy to prepare. My husband is a die-hard fan of breadsticks. Whenever we order pizza, breadsticks have to come along with. As if pizza cannot come home alone 😛 Therefore for me, it was a dish I wanted to learn to make at home. Most of the time I make whole wheat pizza dough and veggie pizza at home whenever we crave it. But I had never tried making breadsticks at home until a few weeks ago. If you know how to make pizza dough then you will find making breadsticks is not that different. 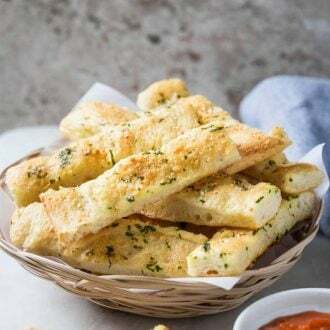 Following some simple steps, you can easily make delicious super soft breadsticks at home that are full of flavor. 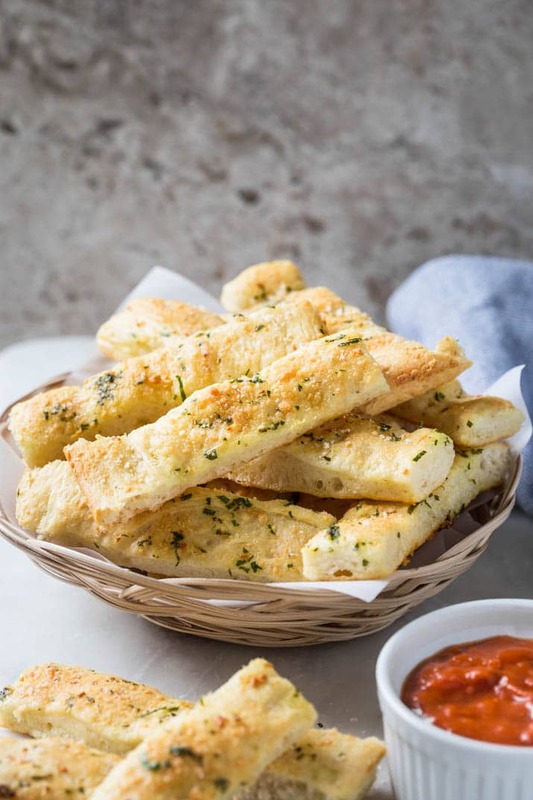 How to make Garlic Parmesan Breadsticks? The secret of best parmesan breadsticks lies is in its dough! 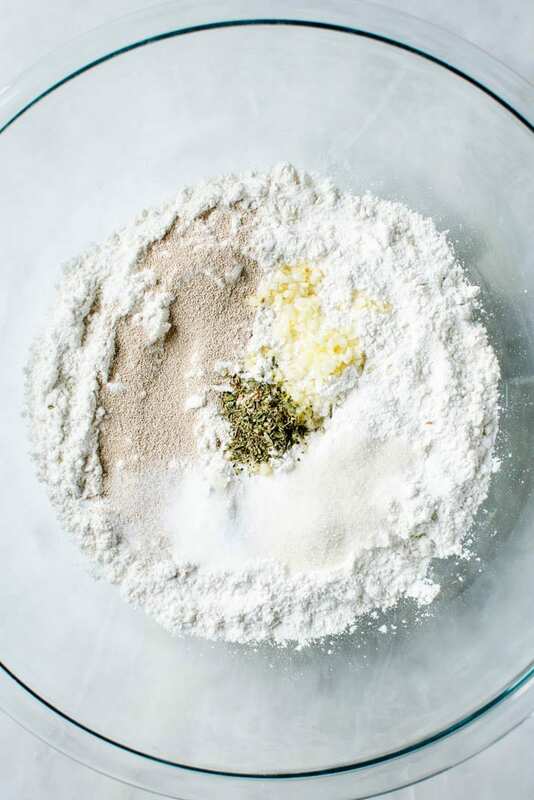 In a large mixing bowl combine flour with yeast, salt, fresh minced garlic, herbs and little sugar. The addition of sugar is necessary to activate the yeast. Then prepare the dough using warm water. Let the dough sit for at least 1 hour for it to rise or until it becomes double in size. Evenly spread the dough on a rectangular baking sheet and let it sit for few minutes to rise. Using a pizza cutter or knife score the dough to form rectangular sticks. Then brush the mixture of butter, minced garlic, and herbs. Sprinkle parmesan cheese generously and bake the dough sticks to perfection in a preheated oven. Serve them warm with some marinara sauce or on the side with this creamy mac and cheese or creamy tomato soup. Helpful Tips and Recipe Variations! You can use milk instead of water to make the dough. Use low fat or whole milk as per your choice. Add some additional grated parmesan cheese in the flour mixture before kneading if you want strong parmesan flavors. Mix up your herb choices depending on what you’re serving your breadsticks with! In a large bowl, combine flour, yeast, sugar, oregano, minced garlic and salt. Mix well to combine. Add warm water to the flour mixture. Then using a wooden spatula mix flour with water until it forms a crumbly mixture. Knead the mixture for about 7-8 minutes using hands either in the bowl or on a flat surface. Intermittently keep adding olive oil to avoid the dough sticking to your hands. Keep the dough at a warm place to rise for about 1 to 1 1/2 hours or until double in size. Spread the dough out evenly on a rectangular baking sheet and let it rise for about 10-15 minutes. Grease the pan with olive oil before placing the dough. Meanwhile, in a small bowl mix butter with minced garlic and finely chopped parsley. Then using a knife or pizza cutter carefully score the dough in 3/4" to 1" wide strips across and in half along the length of the baking sheet. Brush the butter mixture and then generously spread parmesan cheese on the dough sticks. Bake them in the preheated oven for about 25 minutes. 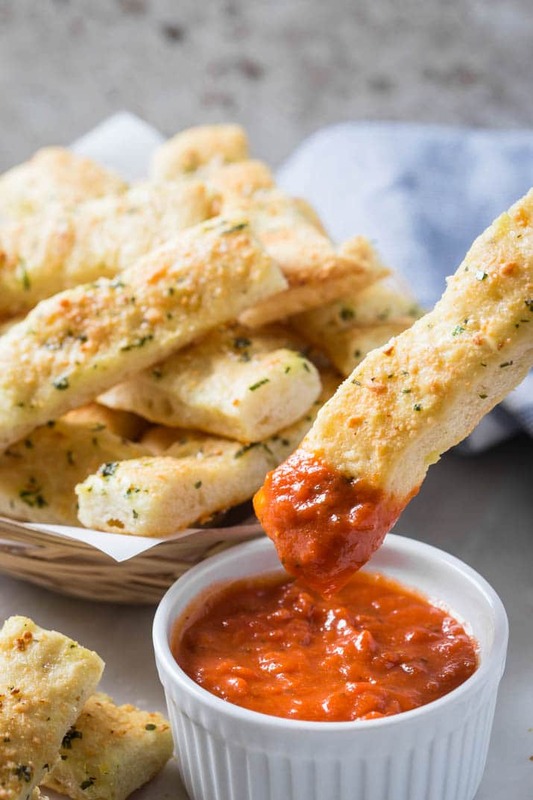 Pin these Parmesan Breadsticks for Later! These look so so delicious! I might have to whip some of these up when my family comes in town next week. We’re starting off the week with lasagna night and these would be great alongside the lasagna! Absolutely! Love a good pasta and breadsticks dinner! I love breadstick! I can’t wait to give this recipe a try. It will be a huge hit in our house. I love that these are made from scratch! Oh yum, those get my vote, especially with that dip! The one thing I simply cannot resist is homemade bread sticks! And with Parmesan and garlic? It’s a real danger for my thighs 😉 Looks absolutely delicious! These are just like the dough sticks you can get at Pizza Express! We like to add some oregano to the topping as well as the parsley. So glad you enjoyed them, Claire!